It wasn't the first driving shoe  that came in the 1950s when Italian race-car drivers wore narrow leather shoes with rubber nubs on the bottoms (the better to gauge the pedals and maintain traction as the foot moved swiftly). 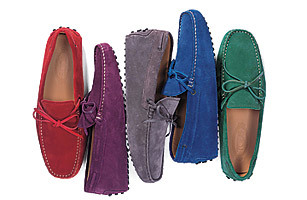 But with the Gommino, Tod's reinvented the style. Created by Diego Della Valle in the late 1970s, it was born of his desire to have an elegant, functional shoe that could be worn on any occasion and withstand a bit more wear than its predecessor. He christened his new brand J.P. Tod's, a name he plucked out of the Boston telephone book for its ease of pronunciation and later shortened to Tod's. It wasn't long before the deceptively simple leather moccasin (it actually requires more than 100 steps to assemble) caught the attention of dapper Fiat magnate Gianni Agnelli, who adopted it as part of his daily uniform and reportedly required all of his company's test drivers to wear Gomminos around the track. Other notable Italians  and soon international headliners like Princess Diana, Harrison Ford and Julia Roberts  quickly followed his lead. Every Gommino ("small pebble" in English) has precisely 133 rubber bumps on the sole and is made through a painstaking process of cutting, sewing and scrutinizing up to 35 pieces of leather by hand. Any shoe that has even the slightest imperfection gets cut in two and tossed into the garbage. The Gommino has been made over in every color of the rainbow and in materials ranging from python to patent leather to custom-made satin and velvet, the last worn by Tom Hanks and Jack Nicholson to the Academy Awards. Unfailingly popular, the Gommino remains Tod's most famous and best-selling item.